“Live” life. Drink its nectar. Be like a river that bends beautifully and changes its course, at each obstacle that comes its way. The twists and turns, seem so obvious to the river as it moves, in a dance, unhindered. I keep reminding myself to adapt to life, accept, go with the flow. I remind myself to look for alternate paths but keep moving, keep “living”, fully. Yes that’s what I am born to do. We all are. 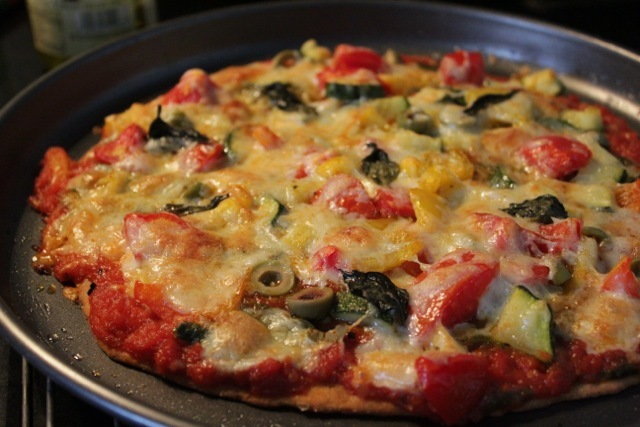 I’ll move on to talk about this post, Yeast free Whole Wheat Pizza. Mr Cinnamon’s (ok I am the “Chillies”) low tolerance to yeast made me resort to this workaround. I am glad…no I am delighted…no we are delighted by the way it came out. I used a combination of Whole Wheat flour, Buttermilk and Soda Bicarb combo for the base and it turned out to be a light and delicious one. And no waiting for the dough to rise! yay! Alright I know, many yeast lovers may not be enthusiastic about this idea. But believe me, this workaround does not compromise on taste. 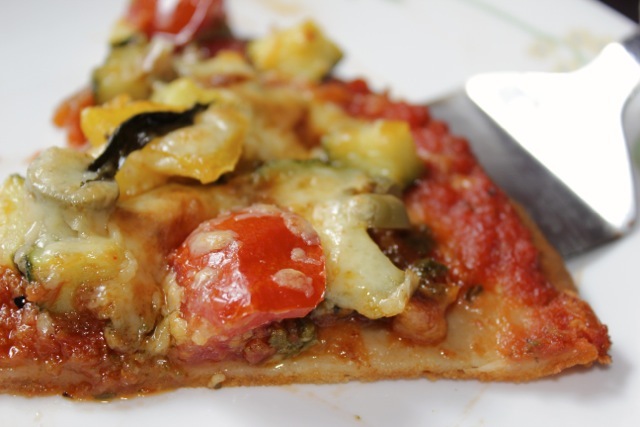 It is a deviation from conventional method, yet a delicious one. 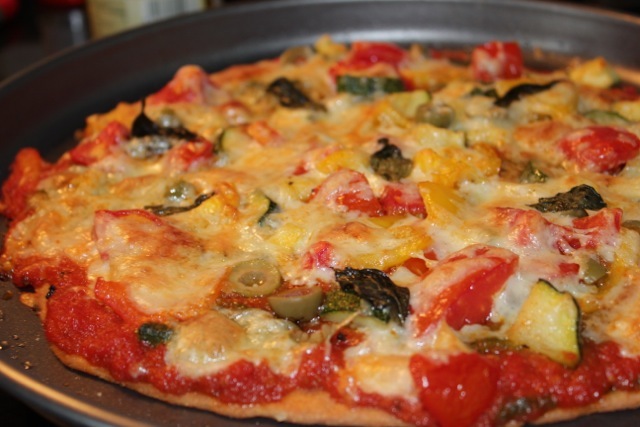 I have used it for a thin crust this time, but I would like to try it for a thick crust sometime too. Mix together, Whole Wheat Flour, Soda Bicarb, Sugar and Salt. Add Olive Oil and mix. Now add Buttermilk little by little and form a soft dough. Keep aside. Pre-heat the oven at 200C or use the temperature mentioned in your oven manual. Some people bake it at 220C. For my oven 190C works best for me. 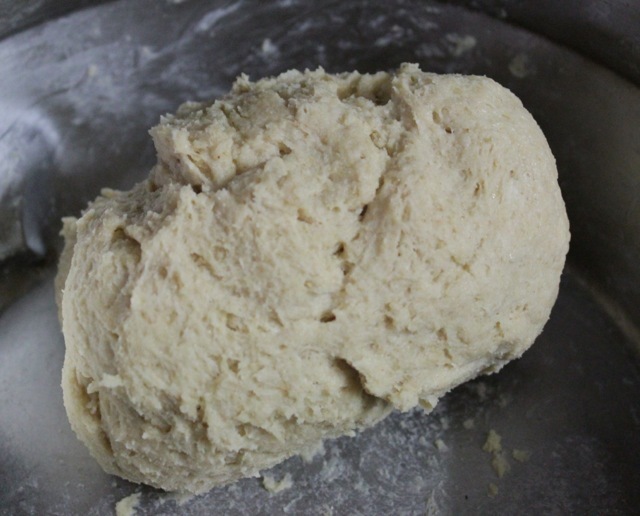 Divide the dough into two parts and shape them like a ball. Sprinkle dry whole wheat flour on the surface. 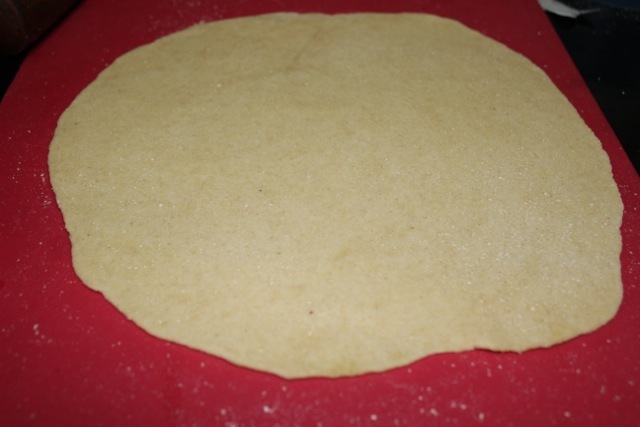 Flatten the dough ball and roll it into a thin pizza base. Don’t worry about getting a perfect round shape, but do keep the thickness even. Place the base in a slightly greased pizza tray. 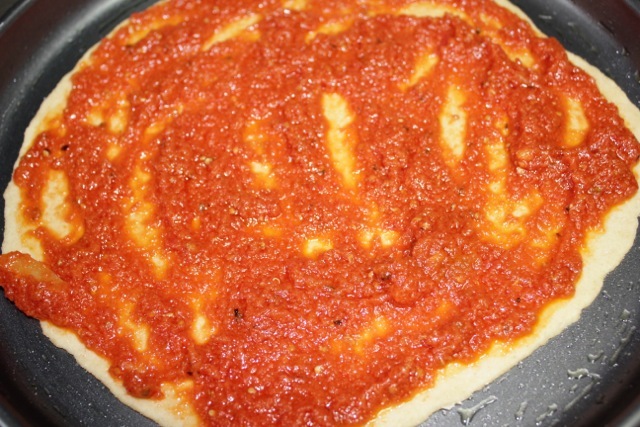 Spread the Pizza Sauce on the base with the back of a spoon. 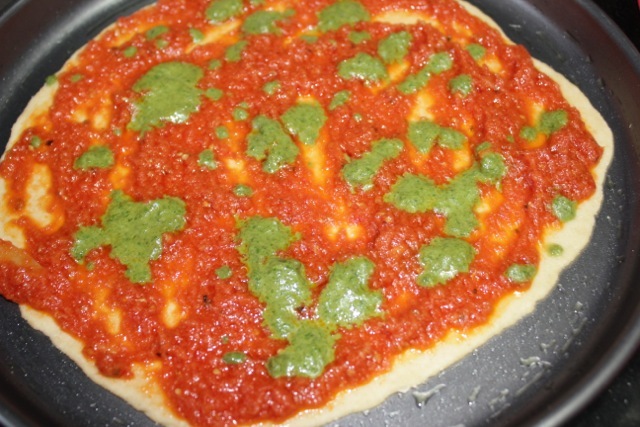 Here I have used home-made thick tomato puree and added salt, sugar, Red Chilli, Oregano, Black Pepper, Dry Basil. I have added pesto separately later. But you can add chopped basil leaves to Home made Pizza Sauce while cooking. Add Pesto. I am using simple basil paste with salt and pepper. Spread the veggies. Ok! I confess! Mine is really loaded! I have sautéed the veggies in Olive Oil. 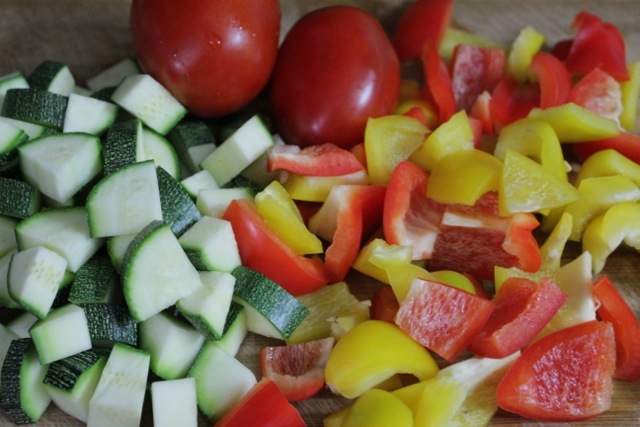 I have chopped the veggies into thick pieces for a chunky bite. Spread Cheese. Sprinkle Olive oil. It helps to give a smoother and shinier texture to melted cheese. 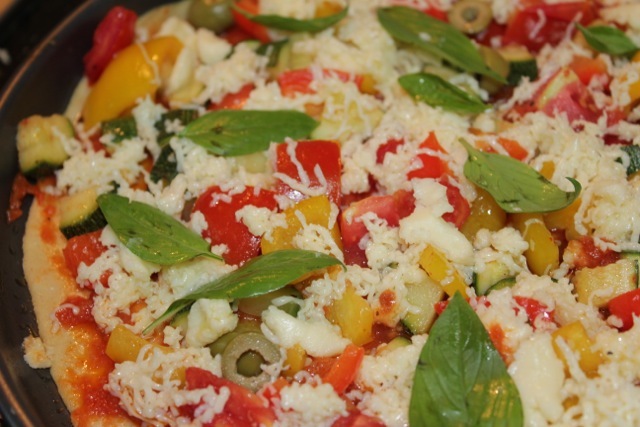 Top it with Basil leaves. The Basil gets really wilted when baked. I didn’t mind that. If you do not like that you could add it at the end. And bake it say for 30 sec to 1 minute. 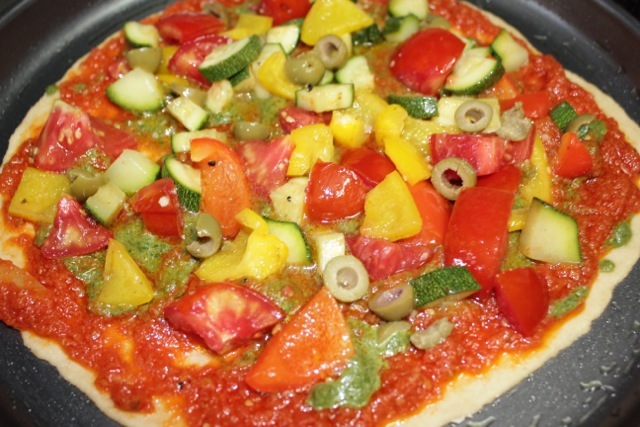 Place the Pizza in oven and bake for 15-20 minutes till crust is browned and cheese is melted and begins to brown. Sprinkle Pizza Seasoning or any seasoning of choice. Cut into slices with a roller knife. Serve hot! ← Upma Leftover and Cheese Patties, Cutlets, Kebabs…whatever! I dont mind inviting myself to ur place to enjoy this delicious,fantastic pizza..
Is soda bicarb interchangeable with baking soda? Thanks!